Add the table you want to geocode to your map. 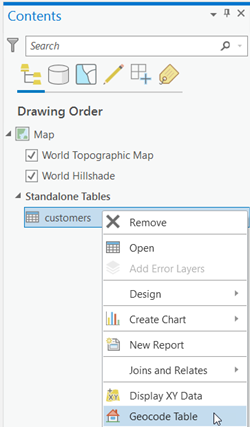 Click Add Data on the Map tab on the ribbon, and click Data in the drop-down menu. Browse to your table, and double-click the table to add it to the map. The table is listed in the Contents pane. Open the Geocode Table pane, and begin the guided workflow. Right-click your table in the Contents pane of your map, and choose Geocode Table. The Geocode Table pane appears. It displays a list of steps to geocode your table. Complete the About your table step of the guided workflow. Confirm that the correct table is displayed in the Input Table text box. Answer the question regarding the number of fields you want to geocode in your data, and select the corresponding option in the drop-down menu. If you are unsure about the number of fields that need to be geocoded, click the Attribute table button to view the table. Complete the What locator are you using? step of the guided workflow. From the Input Locator drop-down menu, choose the input locator you want to use for geocoding. Locators added to the project that support batch geocoding will automatically display in the Input Locator drop-down menu of the Geocode Table pane, or you can browse to a different locator by clicking the browse button. Geocoding a table of addresses using the World Geocoding Service requires an ArcGIS Online organizational subscription. Complete the Mapping the fields in your table step of the guided workflow. For each of the fields in your data that you want to use in geocoding, find the corresponding locator field and choose the appropriate data field in the drop-down menu. The field mapping will be completed automatically, but you should review the field mapping to ensure that you do not want to make any changes or map additional fields. If you need to review the fields in your data that need to be geocoded, click the Attribute table button to view the table. Complete the Output step of the guided workflow. An output location and name is selected automatically. To change the output, click the Browse button . Then, you can either select a new location or change the name. Depending on the locator type you chose for geocoding, output may be limited to either a location on disk or a location on your active portal. However, you can still change the name or the location in the folder structure of your designated output location. Optionally check the Add output to map check box after completion. Depending on the size of your table and the location of output, this operation may be time-consuming. Choose an option for Preferred Location Type from the available drop-down menu. When performing geocoding, you may be using the geocoding results to display on a map or for further analysis. In this case, you may want to change the Preferred Location Type setting to Address Location so that the points represent the rooftop or parcel centroid for the address. The point displayed would be closest to the center of the feature that represents the address. By contrast, you may be feeding the geocoding results into a routing application where you would want the points to be located on the side of the street for better routing, in which case Routing Location would be the better option. With this option, the point displayed is typically closer to the street and would be closer to where a vehicle would arrive at the location. Optionally complete the Limit by Country step of the guided workflow. If available, choose any combination of countries from the displayed list. The capability to limit geocoding by country is determined by the locator you chose and will not always be available. If your locator does not support the Country setting, this page of the guided workflow will not display. When using the World Geocoding Service, or other locators that support multiple countries, you may want to specify that geocoding should only happen in specific countries. This is important because it can improve geocoding performance and reduce the potential for an address to false-positively match in another country. It is possible for an address in one country to look very similar to an address in another country. Geocode Table allows you to choose one or more countries to limit the results of the geocoding. In some cases, your table may contain addresses for many countries, in which case you should have a country field in the data and map that field in the field mapping section of the tool as opposed to selecting multiple countries in this step. Mapping a country field from the table will help to pinpoint the country for each record. Optionally complete the Limit by category step of the guided workflow. If available, choose any combination of categories from the displayed list. The capability to limit geocoding by category is determined by the locator you chose and will not always be available. If your locator does not support the Category setting, this page of the guided workflow will not display. You may want to limit the results of geocoding to specific categories, such as only address matches because the geocoding results are for parcel delivery. Another example is if you know the entire table consists of cities, and you don’t want New York to match to New York State or even New York County. Using this parameter will limit matches to a specific type of location. Review all inputs in the final step of the guided workflow, and run Geocode Table. Make sure all the inputs on the final page of the guided workflow display the inputs you chose in the previous steps. The progress of the tool is displayed at the bottom of the pane. If you selected the Add output to map option in the Output step of the guided workflow, the output is added to the map automatically. Once you have a geocoded feature class, you can add individual geocoding results from the Locate pane if desired. To review or change any of the results, add the feature class to the map if necessary, right-click the new feature class in the Table of Contents pane, and click Data > Rematch Addresses .